Ben Bernanke, whose term as chairman of the Federal Reserve Board expires Jan. 31, should be confirmed by Congress for another term. 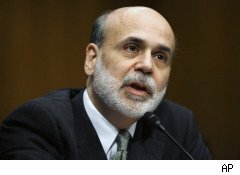 Bernanke has amply proved that his knowledge of the mistakes made during the Great Depression has helped the U.S. avoid a second one.Yes, 10% unemployment (17%, if you count the underemployed and those who've given up looking) shows that there's still a lot of work to be done to heal the financial crisis, but we're a lot better off than we would have been had this country fallen into another Great Depression. And the Fed cannot heal the unemployment situation on its own: It's up to Congress to pass bills to encourage hiring, whether by tax incentives or through other government stimulus programs. Timing is also critical. Unwinding all the programs Bernanke has enacted to keep the U.S. out of a depression requires the same skill that he used to set these programs up. So now is not the moment to change the Fed's leadership. Bernanke's extensive knowledge of the mistakes of the Great Depression is still needed -- and will be for the foreseeable future. What does Bernanke see as those mistakes? The Hoover Administration was too quick to balance budgets and tighten the government's belt. Instead, Bernanke embraces the Keynesian view of economics, which believes that aggressive government action backed by government money is needed to reverse an economic downward spiral by restoring confidence and reviving demand. Abandoning that strategy now risks losing all that Bernanke has accomplished so far. "We also created targeted lending programs that have helped to restart the flow of credit in a number of critical markets, including the commercial paper market and the market for securities backed by loans to households and small businesses. Indeed, we estimate that one of the targeted programs -- the Term Asset-Backed Securities Loan Facility -- has thus far helped finance 3.3 million loans to households (excluding credit card accounts), more than 100 million credit card accounts, 480,000 loans to small businesses, and 100,000 loans to larger businesses. And our purchases of longer-term securities have provided support to private credit markets and helped to reduce longer-term interest rates, such as mortgage rates." Thawed frozen credit markets. Thanks to the money the Fed flooded into the system, most of these private markets are operating again. Kept mortgages flowing at low interest rates. The Fed's purchase of $1.25 trillion in mortgage-back securities has kept mortgage rates at levels that haven't been seen since the 1940s, helping to restart the U.S. housing industry. Improved cash availability to small businesses. When the banks stopped lending, if it weren't for the Fed's programs those 480,000 small businesses would probably still be looking for cash. Has Bernanke's Fed been flawless? Hardly. The biggest mistake it made was bailing out the banks without requiring them to lend more. But you can't blame that entirely on Bernanke. The Troubled Asset Relief Program (TARP) legislation that Congress passed didn't include such a requirement. Indeed, those bailouts have so far encouraged banks to return to risky proprietary trading. Riding the boom that the government's support helped create, that trading paid off big in 2009, resulting in huge bonuses for top bank executives and traders. That problem may potentially be resolved with President Obama's decision to embrace former Fed Chairman Paul Volcker's plan to restrict the size and activities of the largest U.S. financial institutions. "Committed to a More Proactive Approach"
"We are requiring large firms to provide supervisors with more detailed and timely information on risk positions, operating performance, and other key indicators, and we are strengthening consolidated supervision to better capture the firmwide risks faced by complex organizations. In sum, heeding the lessons of the crisis, we are committed to taking a more proactive and comprehensive approach to oversight to ensure that emerging problems are identified early and met with prompt and effective supervisory responses." Building on these lessons learned during the current financial crisis will allow the Fed to develop a better supervisory function. Changing leadership midstream could delay the needed improvements at this critical juncture. Bernanke's biggest problem may be his lack of political skills. Prior to taking his current job, his only political experiences were as chairman of Princeton University's economics department and a stint on a local school board. He's also not known for being a great socializer. In these regards, he's exactly the opposite of his predecessor, Alan Greenspan, who was famous for his political maneuverings and being seen at the right parties or in the right places with the right people. Maybe if Bernanke were more nimble in currying favor, he wouldn't be facing the political opposition now threatening his chairmanship. But Congress shouldn't deny a great leader of the Federal Reserve another term just because he's not good at playing politics.